We were sent a news article from the early 1960's. 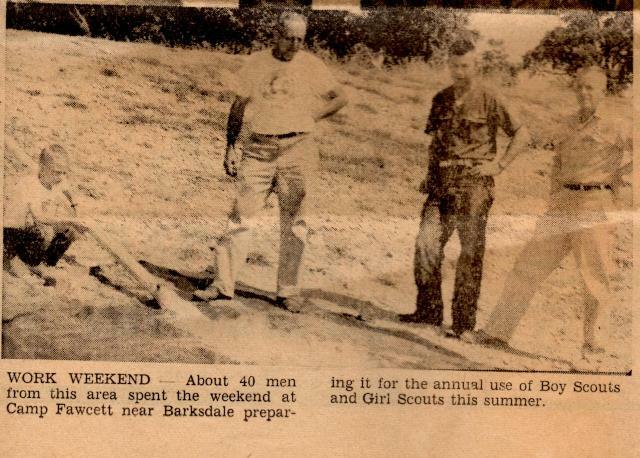 The news article title is "Dads Get Camp Ready for Boys." Unfortunately there are no names associated with the photos. Word from Julius Graw and Russell Tidwell states that the person in the middle is Bob McNeil. Russell mentioned that the pipe goes from the river to Myers Mud Hole. Still waiting on details to explain the Myers Mud Hole. "A work weekend at Camp Fawcett Saturday and Sunday drew more than 40 men from Del Rio, Uvalde, Rocksprings and Camp Wood to ready camp for Boy and Girl Scouts summer camps. Among the work accomplished by these men were included new roofs, refrigeration repair, painting and other repairs. The San Felipe Lions Club which sent seven members to help, constructed a new roof on the canteen, repaired the floor and painted the building. Lions were J. B. Pena, R. D. Weaver, Richard Carranza, Ed Constancio, Richard Hoffman, Roberto Felan and Henry Felan. Dads of Troop 280 at Laughlin Air Force Base built a new roof on a latrine. Members of the Del Rio Kiwanis Club removed the refrigeration motors and put them in running order. 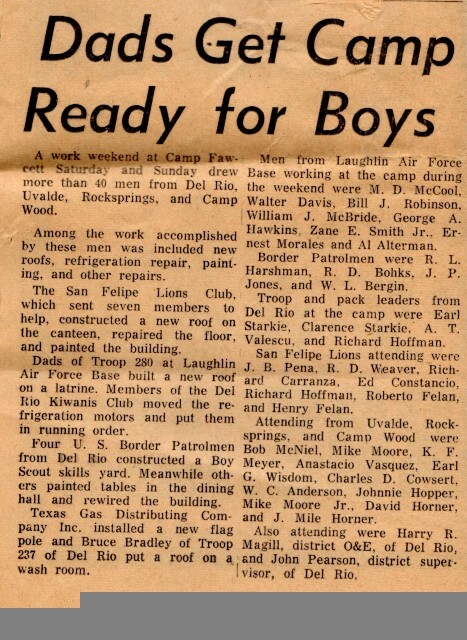 Men from Laughlin Air Force Base working at the camp during the weekend were M. D. McCool, Walter Davis, Bill J. Robinson, William J. McBride, George A. Hawkins, Zane E. Smith, Jr. Ernest Morales and Al Alterman. 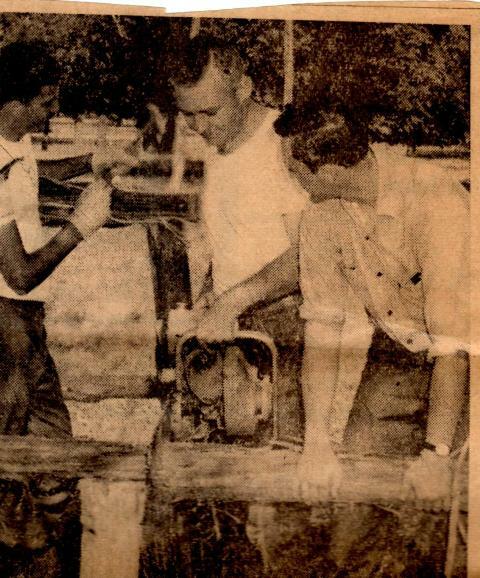 Four U. S. Border Patrolmen from Del Rio constructed a Boy Scout skills yard. Meanwhile others, painted tables in the dining hall and rewired the building. Border Patrolmen were R. L. Harshman, R. D. Bohks, J. P. Jones and W. L. Bergin. Texas Gas Distributing Company, Inc. installed a new flag pole and Bruce Bradley of Troop 237 of Del Rio put a roof on a wash room. Troop and pack leaders from Del Rio at the camp were Earl Starkie, Clarence Starkie, A. T. Valescu and Richard Hoffman. Attending from Uvalde, Rocksprings and Camp Wood were Bob McNiel, Mike Moore. K. F. Meyer, Anastacio Vasquez, Earl G. Wisdom, Charles D. Cowsert, W. C. Anderson, Johnnie Hopper, Mike Moore, Jr., David Horner and J. Mile Horner. Also attending were Harry R. Magill, district O & E, of Del Rio and John Pearson district supervisor of Del Rio." To our knowledge most if not all of the above mentioned volunteers have passed on, but lets consider this thought: The building, the growth, the sustainability, the engine and the long-term health that makes scouting or any non-profit function is strongly rooted in the passionate strength of volunteerism. Thank those who volunteer in your area.